JNN 03 Sept 2014 Tripoli : Libya’s government admitted Monday, September 1, that it has lost control of Tripoli to armed militias. The interim government led by Prime Minister Abdullah al-Thani, which resigned last week, said armed groups, mostly Islamist militias, were in control of ministries and blocking access to government workers, Rappler reported. “Ministry and state offices in Tripoli have been occupied by armed militias who are preventing government workers from entering and are threatening their superiors,” the government said in a statement. Libya has been sliding into chaos since Muammar Gaddafi was overthrown and killed three years ago, with interim authorities confronting powerful militias which fought to oust the veteran ruler. The interim government announced last week that it had tendered its resignation to the elected parliament, days after a rival Islamist administration was created. The parliament and government are operating out of Libya’s east for security reasons. A rival body, the General National Congress, last week named pro-Islamist figure Omar al-Hassi to form a “salvation government”. 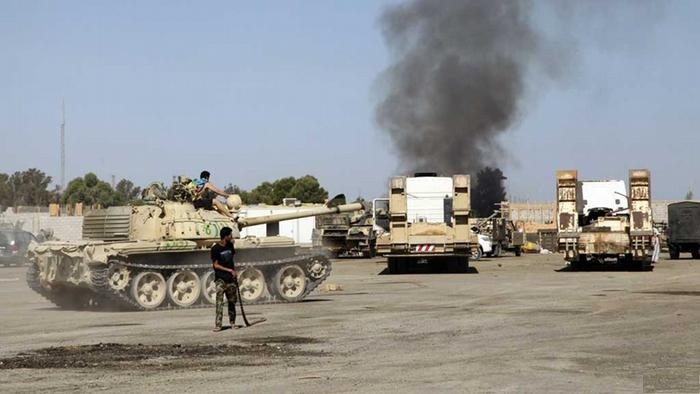 Interim authorities have been steadily losing ground to the militias and the Fajr Libya (Dawn of Libya) mainly Islamist alliance, which seized Tripoli airport on August 22 after weeks of fierce fighting with nationalist rivals. On Sunday, the militiamen moved into the U.S. embassy compound in Tripoli that was evacuated in late July, with videos showing cheering men diving from an upstairs balcony into the facility’s swimming pool. Dawn of Libya members said they had gone in to secure the complex of several villas in southern Tripoli, not far from the airport, to prevent it from being looted. U.S. Ambassador Deborah Jones, now posted in Malta, said on Twitter that there was no indication that the complex had been damaged. An AFP photographer who visited the complex spotted no damage apart from some shrapnel scars on an exterior barbed wire-topped wall. A political transition has been stymied by the political deadlock pitting Dawn of Libya against the internally-exiled authorities, which are operating from Tobruk, 1,500 kilometers (more than 900 miles) from the capital. Dawn of Libya rejects the legitimacy of the elected parliament because it allegedly supported air raids last month — which U.S. officials said were carried out by the United Arab Emirates — against its fighters deployed at the airport before they defeated nationalist militia rivals. Parliament has in turned branded Dawn of Libya as terrorists, putting them in the same boat as the Ansar al-Sharia members who control most of Benghazi. Libya’s official news agency says the country’s elected parliament has tasked the recently resigned prime minister with forming a new government, according to AP. LANA says the parliament convening in Tobruk voted Monday to name Abdullah al-Thinni as the new head of an 18-portfolio Cabinet, of which seven ministries would participate in a “crisis” rouping. The agency didn’t elaborate. This entry was posted in AFRICA and tagged Islamist Militia, Libya. Bookmark the permalink.